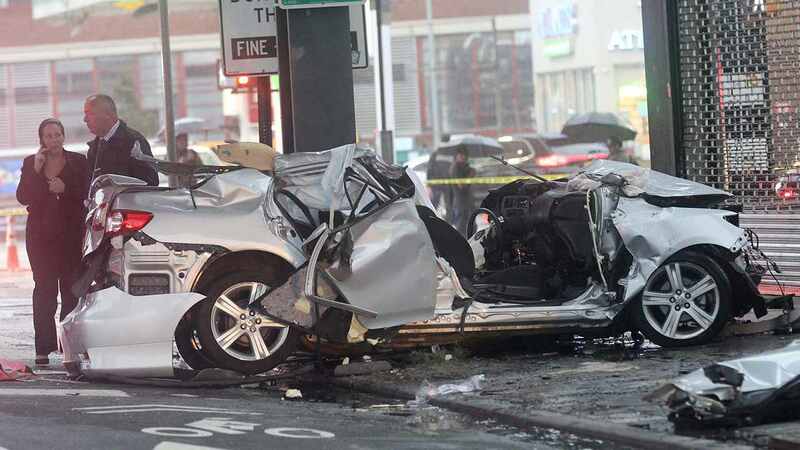 LONG ISLAND CITY, Queens (WABC) -- A man was killed in Long Island City Saturday morning in a collision with a truck. Around 6 a.m., police responded to the intersection of Skillman Avenue and Queens Boulevard. According to the New York City Police Department, a 28-year-old man, identified as Steven Narvaez, of Woodside, was found unconscious with severe body trauma. He was pronounced dead at the scene. His 17-year-old female passenger also was injured. She was taken to Elmhurst General Hospital, where she is critical. A 2013 Toyota Corolla sedan, was traveling west on Skillman Avenue, approaching Queens Boulevard. It ran into a 2007 Freightliner tractor that was traveling northbound on Queens Boulevard, heading toward Skillman Avenue. The sedan hit the truck, then came to a rest underneath it. The truck operator remained on the scene and was uninjured.